May 1904. Coney Island's newest amusement park, Dreamland, has just opened. Its many spectacles are expected to attract crowds by the thousands, paying back investors many times over. Kitty Hayward and her mother arrive by steamer from South Africa. When Kitty's mother takes ill, the hotel doctor sends Kitty to Manhattan to fetch some special medicine. But when she returns, Kitty's mother has vanished. The desk clerk tells Kitty that she is at the wrong hotel. The doctor says he's never seen her before, although Kitty notices he is unable to look her in the eye. Alone in a strange country, Kitty meets the denizens of Magruder's Curiosity Cabinet. A relic of a darker, dirtier, era, Magruder's is home to a forlorn flea circus, a handful of disgruntled Unusuals, and a mad Uzbek scientist. Magruder's Unusuals take Kitty under their wing and resolve to find out what happened to her mother. But as a plague spreads, Coney Island is placed under quarantine. The gang at Magruder's finds that a missing mother is the least of their problems, as the once-glamorous resort is abandoned to the freaks, anarchists, and madmen. 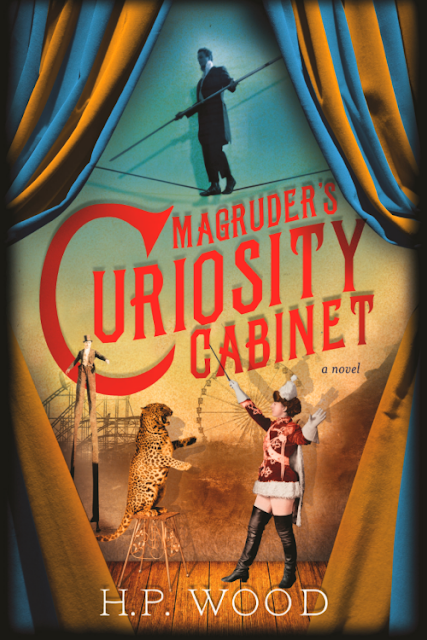 Magruder's Curiosity Cabinet is one big curiosity at the wrong end of Coney Island set around 1904. Opening the door only increases the likelihood that someone might actually come on in. However, only a fool like me would enter, but enter you should. Dust down those fantasy braincells and enter into the world that is breathtaking, amazing and very original. This is NOT a children's book even though the book cover might lead younger readers into believing that it is due to it's playful nature. However, this book has to be one of the best debut adult books that I have read for some time. The last book to make me feel like this was Erin Morgenstern's 'The Night Circus' which does have some similarities, in my opinion. Both books have a magical and mysterious setting that will absorb you slowly and intellectually into the story; they are written and researched very well. Attention to detail is a key for books like this - trying to get the period details as accurate as you can. Getting the mood of the time and making it feel "real" and "believable" enables the writer, in this case, to draw you into a chaotic and vibrant world that is unique, enchanting and very, very strange. Once you start on this journey and turn the pages, the plot will certainly fly by. You will not only read this story you will actually inhale it, feel it and almost touch it. You will walk the Boardwalk in the footsteps of an eclectic mix of characters known as the Unusuals or "freaks of nature". These are biological rarities that were exhibited to shock you and sometimes deceive you. In this case, they will charm you like a prize rattlesnake in full flight. You get to feel and uncover all of the characters emotions and back stories - not just the main ones. It's gripping stuff! You start out with Zep as he unlocks the heavy oak door of Theopilus P. As a result of Magruder's Curiosity Cabinet, like all of the other characters, you will soon find yourself gravitating to this special place of intrigue, mystery and science. You will really not want to leave. This book pulls no literary punches and hides behind no fairground ride. It is a book of death, violence, corruption and certainly greed. The inhabitants of Coney Island face a deadly coughing strand of the plague, which brings a world of chaos, mayhem, destruction and a rather unpleasant death. It will have you engrossed until the very end of the narrative and beyond. This is a very special read that you will not forget in a hurry. It's a rollercoaster of weirdness and the extreme bizarre. It's full of sadness, happiness, action, friendship, murder, mystery and romance. It's a fantastically colourful insight into a lost world; around every corner you will marvel at the craziness such as the flea circus, mad scientists, con artists and disgruntled characters. It is all in there as it has been lifted out of the author's amazing imagination and put before your very eyes. Some people may not get everything behind this book, as it's an acquired taste for sure. However it's an incredible read that I really loved, and I really hope that you will too. I only wish that I'd visited Coney Island on my recent NYC holiday. I would love to see H.P Wood write another story around this setting; the characters certainly deserve this, in my opinion, and so do I as the reader. This book is due to be published in the US by Sourcebooks in June 2016.